One of the top-tier models on the market, the Bushnell Pro X2 leaves nothing to chance and is the best laser rangefinder for your golfing. 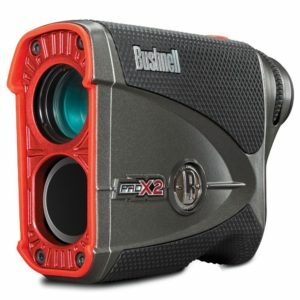 It doesn’t matter if you want to use it in private or at a certified tournament, the Bushnell Pro X2 is suitable for all golf-related purposes. The device is built from high-grade materials and offers extreme precision and speed of operation, delivering more impressive results than the majority of its competitors on the market, even in the same price range. You will not only get an accurate distance reading in a short time frame after pressing the button, but the device is capable of additionally stabilizing the signal through extra bursts, making the reading even more reliable and precise. The rangefinder can work at distances from 5 to 1,300 yards, and it’s accurate to 1 yard when measuring flags at 450+ yard distances. As we mentioned above, it provides additional stabilization of the output, making it more reliable in difficult conditions, or when you need to take multiple measurements on the go. On the outside, the Bushnell Pro X2 offers everything you’d expect from a device in this price range, with a sturdy, well-built body that can take a lot of abuse, and a comfortable grip that will ensure that you’ll never accidentally let go of your rangefinder in a more difficult situation. What’s more, the body of the device actually offers additional armored coating, with an extra layer of metal protecting your investment against most types of harsh damages. Last but not least, it’s completely waterproof and you can safely use it in golf courses that run through deeper waters. Reports about the water durability of the device are great across the board, and they left us with the impression that this model is borderline indestructible. Of course, we wouldn’t advise putting that theory to the test, but for most people’s needs, the Bushnell Pro X2 should fit the profile just fine.